A tradition need long time and some reasons why people keep repeating it that long. Sometimes the long life itself could be proof of its worth. Moreover, the fact a game have been loved constantly and stayed in existence with its pleasure tells that it has the value to be acknowledged as a good one. Black and White stones, and a wooden board as their battle field. These simple instruments and just two player are all you need to play it. Baduk has lasted over 2,500 years. How it could be? Because it offers not only entertainment and the thrill of competition, but it also provides a useful tool for studying human mental faculties and artificial intelligence. Today you can get plenty of games easily and they are getting more fascinating. Far from falling off in this competitive field, Baduk has revived as a popular computer game also, instead. Baduk, the longest played game has been established in a culture now. Baduk has meant so much more than just a game to many people; it is regarded as an art, science and even pedagogy in Korea, China and Japan, and has spread to the western world. As an old Chinese saying goes, it will give you good friends, harmony, knowledge of life, peace of mind, and even longevity. These might be the reason people say Baduk is not merely a game but life itself. It may sound unconvincing that a simple pastime can include all the aforementioned virtues, but as you become familiar with Baduk, you will understand that a player will gain them naturally – without any additional effort – just by playing. Surprisingly, despite all its benefits, Baduk is not a very complicated game to learn. In fact, the rules are very simple and you can learn them in a few minutes. The only thing left for you is to play and enjoy the game. Even Baduk has only one important but simple rule that two people put black and white stones alternately, people used to feel difficult to play it. You should foresee what will happen several turns hence and even what the opponent think. It is a so psychological and strategic game. For beginners, it’s harder. You can’t get some places or teachers easily. Especially foreign amateurs have difficulty in getting useful help. Since Baduk is rooted in China, Korea and Japan, foreigners get insufficient informations evne their huge interest and demand about it. There are regular Baduk competition over the world already and many foreigners attend them. Their interest and need are getting bigger and bigger for Baduk, but its supply are not enough. Chihyung Nam a professional Baduk player in Korea and professor wrote the newly-published book Baduk, Made Fun and Easy to help these Baduk these foreign beginners. 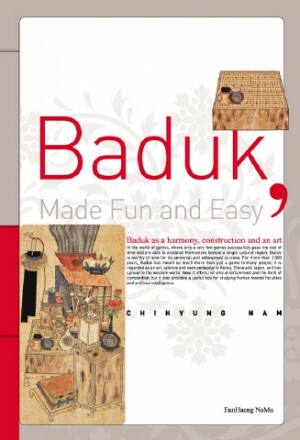 This book is from her popular series of articles “Baduk, Made Fun and Easy” published in The Korea Times over a year. Nam gives you great lessons from the basic of Baduk including the terms and rules to practical steps by stages. Until now, foreigners used to get some information about it from Japan, so they feel Japanese word “Go” more familiar than “Baduk” the Korean. Nam is talking about ‘Baduk’ not ‘Go’ now, but you can enjoy this book without confusion. Baduk fans over the world are interested in Korean Baduk, but they get few information about Baduk. They concern Korean Baduk including its term and professional player in Korea more and more. You can get not only basic Baduk rules and techniques but also Korean Baduk culture and its pleasure. 하나의 전통이 만들어지기까지는 오랜 세월과 그 오랜 세월 동안 꾸준히 반복할 만한 이유가 필요하다. 따라서 긴 수명을 자랑한다는 것은 때로 그 자체로 가치를 증명할 수 있는 것이다. 더구나 사람들에게 즐거움을 주기 위한 놀이가 끊임없이 사랑받고 오랜 시간 명맥을 이어왔다는 점은 그 만큼 인정받을 만한 요소가 있음을 느끼게 한다. 검은 돌과 흰 돌, 그리고 그들의 전장인 나무판, 이 간단한 도구와 두 사람만 있으면 바로 시작할 수 있는 놀이, 바둑. 바둑이 2500년이 넘는 긴 시간 동안 그 맥을 이어올 수 있었던 것은 단순히 상대방을 이기는 데서 얻는 만족 그 이상의 것을 주기 때문일 것이다. 오늘날 수많은 게임이 쏟아져 나오고 놀라운 기술과 현란한 볼거리를 제공하는 가운데서도 바둑은 쇠퇴하지 않고 심지어 온라인 게임으로 다시 태어나 꾸준히 인기를 끌고 있다. 가장 오랜 세월 지속된 놀이이자 하나의 문화로 자리 잡은 바둑의 세계는 어떤 매력이 존재할까. 옛 격언에 ‘기도오득(基道五得)’이라 하여 바둑을 통해 얻을 수 있는 다섯 가지 좋은 점을 말하고 있다. 첫째는 좋은 친구요, 둘째는 사람과의 화목함이고, 셋째는 인생의 교훈이며, 넷째는 마음의 깨달음, 그리고 마지막 다섯째는 천수(天壽)를 누리는 것이다. 이에 바둑을 가리켜 ‘인생의 축소판’이라 하는 지도 모른다. 하나의 놀이를 통해 이러한 것을 얻는다는 것은 쉽게 이해하기 어려운 일이지만 일단 바둑을 접하고 그 깊이를 이해하게 되면 이러한 삶의 깨달음 또한 저절로 터득하게 될 것이다. 그렇다고 바둑이 보통 사람은 하기 어려운 심오한 것이라고만 생각할 필요는 없다. 바둑이 주는 깊이와 의미 때문에 바둑이 주는 재미가 반감되는 것은 아니다. 오히려 그 즐거움 때문에 바둑의 가치가 더욱 인정받고 있는 것이다. 누구나 바둑의 기본 원리만 제대로 터득하면 바둑을 쉽고도 재미있게 즐길 수 있기 때문이다. 바둑은 언뜻 생각하면 두 사람이 번갈아 검은 돌과 흰 돌을 둔다는 간단한 규칙이지만 흔히 배우기 어렵다고 여겨진다. 몇 수 앞을 내다보며 수를 두어야 할 뿐 아니라 상대방의 수를 예측하고 그 생각을 읽어야 하는 지극히 심리적이고 전략적인 놀이이기 때문이다. 접하면 접할수록 끝이 없는 바둑의 길이지만 처음 바둑을 시작하고자 하는 이들에게는 더욱 어렵게만 여겨진다. 배울 수 있는 곳은 한정되어 있고 혼자 시작하기엔 기초부터 배울 만한 정보가 부족하기 때문이다. 특히 바둑이 중국과 한국, 일본에서 뿌리 깊게 내려온 놀이문화인 탓에 바둑에 관심이 있는 외국인들은 배우고 싶어도 한정된 정보에 어려움을 겪어 왔다. 비록 바둑이 한국, 중국, 일본 아시아 삼국에 중심을 두고 있기는 하나 바둑에 대한 외국인들의 관심도 꾸준히 증가하여 이미 세계 각지에서 바둑대회가 꾸준히 열리고 있다. 외국인들의 바둑에 대한 관심과 수요는 급증하고 있지만 이들의 갈증을 풀어줄만한 정보는 턱없이 부족한 것이다. 이번에 현 프로기사이자 명지대에서 바둑학을 가르치고 있는 남치형 교수가 쉽게 바둑을 배울 수 있도록 돕기 위해 펴낸 신간 는 이런 세계적인 바둑 애호가들을 위한 훌륭한 안내서이다. (은행나무 刊/전문 영어) 이 책은 코리아 타임즈(The Korea Times)에 1년가량 같은 제목으로 연재하며 많은 외국인 바둑 초보자들에게 좋은 평을 받은 것을 묶은 것으로 바둑 용어 설명과 경기 진행 방식 등 아주 기초적인 단계부터 시작하여 행마에 이르기까지 단계별로 쉽게 따라올 수 있도록 정리했다. 지금껏 외국인들이 접할 수 있는 바둑 안내서는 대체로 일본에서 전해진 것이어서 ‘바둑(Baduk)’이라는 용어 대신 ‘고(Go)’라는 일본어로 더 알려져 있다. 일본의 고와 한국의 바둑이 크게 다른 것은 아니지만 남치형 교수는 세계의 바둑 애호가들에게 일본의 ‘고’가 아닌 한국의 ‘바둑’을 가르치고자 책의 제목에 ‘바둑’을 넣었다. 한국은 세계적인 바둑 강국이지만 그 동안 일본이 자신들의 ‘고’를 널리 홍보하고 알려온 것에 비해 한국의 ‘바둑’에 대한 홍보는 아주 미미한 수준이었다. 이에 한국 바둑에 대한 외국 바둑 애호가들의 관심에도 불구하고 이렇다 할 정보가 없었다. 최근에는 한국 바둑 용어에 대한 세계 바둑 대호가들의 궁금증도 커지고 있으며, 바둑 용어가 일본어 위주인 것에서 벗어나기 위해 영어식 표현으로 바둑 용어를 대체하고자 하는 움직임도 있다. 이 책을 통해 세계 바둑 애호가들은 한국 바둑 문화를 더 자세히 알 수 있는 기회를 얻을 수 있을 것이고 한국 바둑의 깊이뿐 아니라 그 즐거움 또한 찾을 수 있다. 그간 기초부터 시작하는 바둑 실용서에 대한 필요를 느꼈던 각국의 바둑 애호가들은 쉬우면서도 자세한 설명과 이해를 돕는 도판을 통해 차근차근 저자의 강의를 읽다보면 어느 새 바둑의 재미에 푹 빠질 것이다.